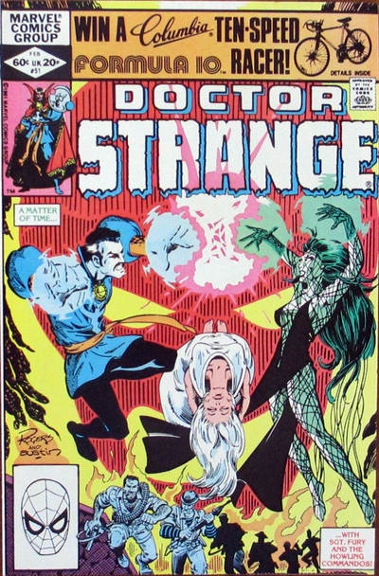 Doctor Strange has often worked best on the periphery of the Marvel Universe, dipping a toe into the core continuity now and then. There’s plenty of supernatural material to explore, other realms and states of being. 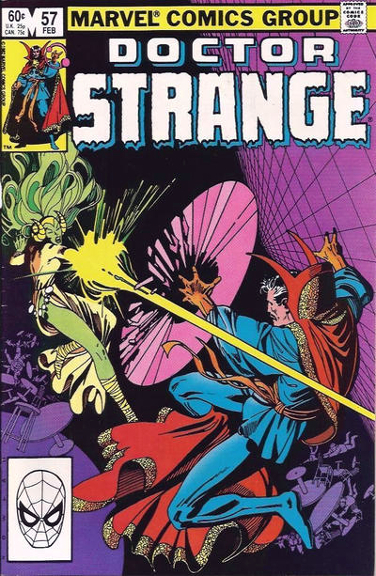 It was that very back to the basics approach that was the hallmark of Roger Stern’s run on Doctor Strange in the early 1980s. Marvel Masterworks: Doctor Strange Vol. 9 catches up to this now-classic run, which features some of the best artists working at the time. 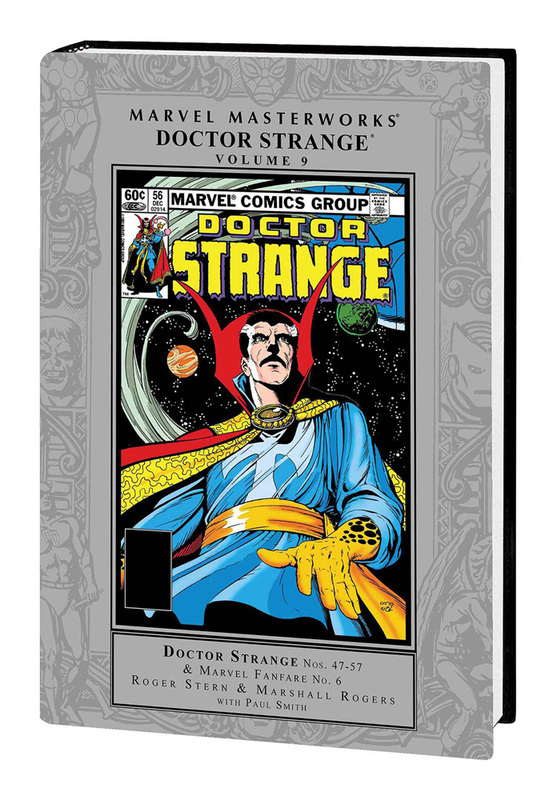 This hardcover will include Doctor Strange #47-57, Marvel Fanfare #6, Crazy #88, and material from the original Official Handbook of the Marvel Universe. Despite a house ad promising Stern would be working with Frank Miller (which I hope they include), he arrives with #47, working with mainstay Gene Colan, who had been associated with the good doctor since 1968. It’s a familiar feeling story with Doctor Doom and Ikonn pitted against the Master of the Mystic Arts. Things don’t really begin to fresh until the following issue when Stern is joined by the team of Marshall Rogers and Terry Austin, hot from their classic Detective Comics run. As he began his run, the Ithaca, NY-based writer told George Khoury he did little occult research. “A little, but not too much. I crossed paths with a few people in the city who were into the ‘occult scene’ as it was at the time. Nice people, for the most part, but I couldn’t write the book just for them. You have to realize that studying the occult is like studying religion and mythology. There’s some interesting stuff there, but a lot of it is contradictory. As he arrived, Stern recognized that Clea was both apprentice and lover, which felt wrong. He began working to separate them in an organic manner, while introducing his next romantic partner, Morganna Blessing, in #48. “Partly, that was my own little back-to-the-basics approach. The early Doc stories had him standing between normal people and the forces of the beyond. There was an unfortunate tendency in writers to let the weird stuff take over in Doc. But if everything in the series is weird, and everyone is a mystic, then nothing is special anymore. “Morgana Blessing was the sort of woman that Doc would have had a relationship with, in his previous career as a high-priced surgeon. She was the Earthly love, in contrast with the ethereal, extradimensional Clea. All the regular readers loved Clea, of course, but the relationship she and Doc had was not exactly an enlightened one. If Clea had just been Doc’s lover that would have been okay, but she’d also become his student, his disciple. It was a case of “I love you, Clea.” “And I love you, Master.” And not in a sweet, innocent, “I Dream of Jeannie” way, either. Not a healthy relationship…not healthy at all. “Frank Miller and I had several long conversations about that during the five minutes or so when he almost became the regular penciler on Doc. I gave that a lot of thought, and that led to the story arc Marshall Rogers wound up drawing – the one that started by introducing Morgana and culminated with Clea leaving Earth,” Stern told Khoury. 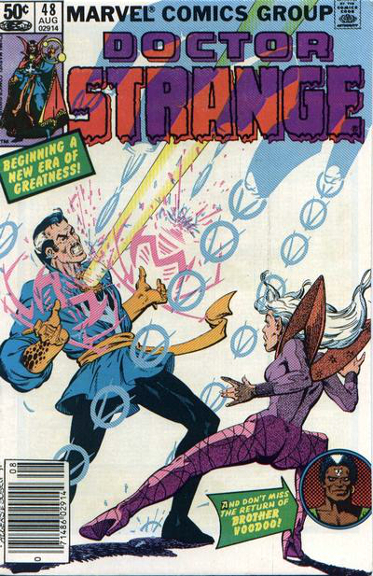 Fairly quickly, Stern began revisiting the core opponents, starting with Baron Mordo in #49 and Dormammu in #50. Of course, there’s a connection here along with some fun time traveling that allowed Stern to have the good doctor interact with Sgt. Fury and His Howling Commandos in issues #50 and 51. Unfortunately, the dreaded deadline doom could not be defeated and Stern and J.M. DeMatteis split issue #54, along with guest artists Paul Smith and Brent Anderson & Joe Rubsintein. The following issue was all Stern with D’Spayre, a more modern foe, in a one-off pencilled by Michael Golden. All along, Austin remained aboard, keeping the look sleek and consistent. 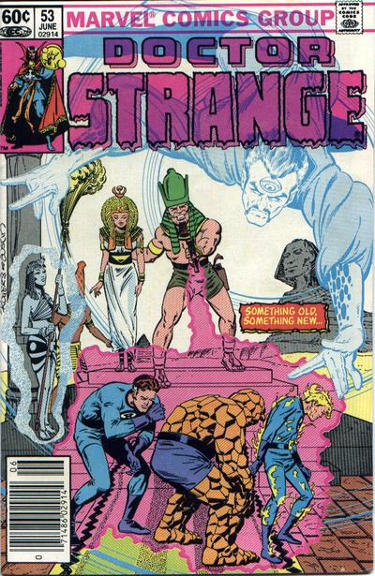 With issue #56 it was clear Rogers was gone and Smith had taken up residence in the Secret Sanctorum. 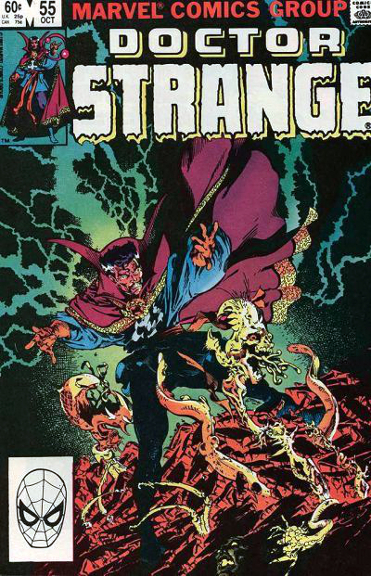 That allowed Stern to retell the origin for newer readers, using Demonicus, Adria, and Kaecilius (yes, the guy appeared in the movie), last seen in Strange Tales #143. Smith would miss the next issue but his long run kicks off the next volume in this line. In the final regular issue in this volume, Kevin Nowlan pencils the issue in a fun story that shows what happens when word spreads that Clea has left. Every magical dabbler comes knocking, seeking to replace her. “Oh, there’s always room for humor. 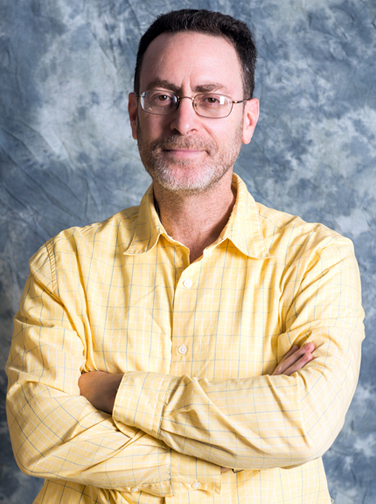 The trick is to make sure it’s the right amount and the proper kind of humor for the character,” Stern told Khoury. 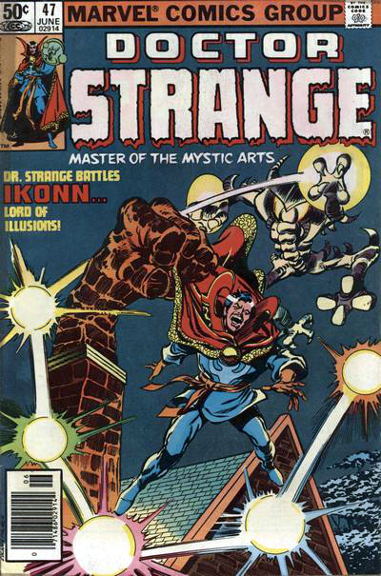 During this run, Stern partnered with the great fantasy illustrator Charles Vess for a story that ran in Marvel Fanfare in 1983. Given the interest in the sorcerer at this time, it made sense to poke some fun at him as seen in “Doctor Strange’s Haunted Pathways: The Game of Mystical Mindrot”, from creators Steve Skeates and Stephen Mellor. Overall, these were refreshing, fun stories that hold up nicely and are certainly worth a second read.